Make sure to check the condition of your collector tube periodically. Oil Skimmers, Inc. recommends doing so every six months. To order a replacement tube, contact us at 1-800-200-4603, or by email at: info@oilskim.com. You may not know the Part Number for your collector tube. Here's a handy chart for your reference. The length of your tube is the distance from end to end if the tube to be cut and laid straight. Use that length to replace "X" in the chart below. Don't know your tube length? 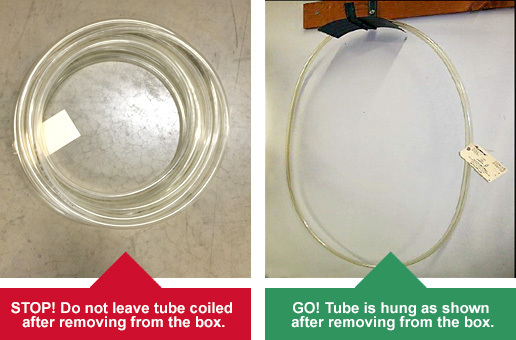 Remove the collector tube from the carton immediately and hang as shown below. The collector tube must be hung in an untwisted condition for no less than two days before being installed on the skimmer. Failure to hang the collector tube as shown may cause the tube to twist, resulting in operation malfunction or damage to the oil skimmer. NOTE: After replacing the collector tube, and prior to powering the skimmer, check the oil level in the skimmer housing. Add 30W, non-detergent oil if needed. Leare more about Brill® oil skimmers with the free-floating collector tube.